ISLAMABAD, Pakistan — A Pakistani Christian woman who was cleared last week of blasphemy charges after spending eight years on death row has been released from prison but remains under government protection because of threats to her life, officials said Thursday. The woman, Asia Bibi, was released from a prison in central Pakistan and flown to the capital, Islamabad, late Wednesday night, a senior government official said Thursday on the condition of anonymity because of the delicacy of the matter. One official, however, denied news reports that Ms. Bibi had already flown out of the country. “She is in Pakistan,” said Mohammad Faisal, the spokesman for Pakistan’s foreign office. Ms. Bibi’s family has appealed for asylum, saying she is in grave danger as hard-line Islamists call for her execution. Her lawyer, Saiful Malook, has already left Pakistan, citing threats to his own life. The Dutch foreign minister, Stef Blok, on Thursday offered Mr. Malook a place in the Netherlands’ Shelter City program, under which human rights advocates facing danger are allowed to stay temporarily in a Dutch city. “The situation of Asia Bibi has our full attention,” Mr. Blok said on Twitter. The Supreme Court acquitted Ms. Bibi on Oct. 31 in an exceptionally rare ruling against a blasphemy verdict. The three-member bench concluded that there was little evidence that Ms. Bibi, a farmworker and mother of three, had spoken against the Prophet Muhammad during a heated argument with Muslim women in 2009. 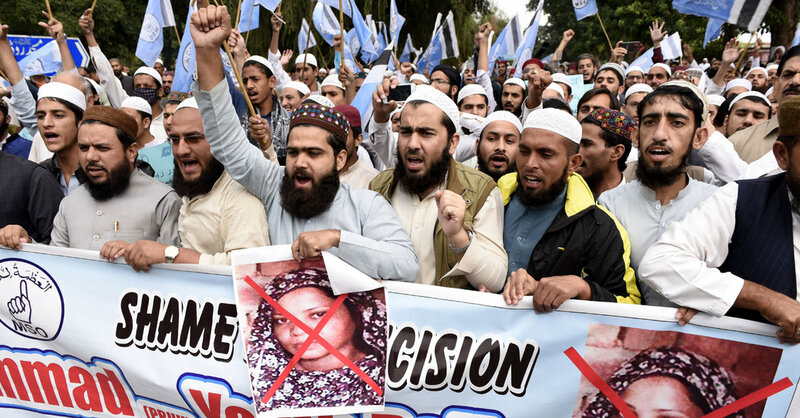 She was convicted and sentenced to death in 2010, a verdict that drew worldwide condemnation and focused attention on Pakistan’s blasphemy law, which critics say has been used to persecute religious minorities. The Supreme Court’s ruling last week clearing Ms. Bibi set off violent protests across the country that were spearheaded by Khadim Hussian Rizvi, a fiery religious cleric. Mr. Rizvi’s supporters paralyzed large parts of the country for two days, blocked highways and damaged several dozen vehicles. Religious leaders called for the three Supreme Court judges on the panel that acquitted Ms. Bibi to be killed, and they urged generals to revolt against the army chief, Gen. Qamar Javed Bajwa, who they accused of acquiescing to Ms. Bibi’s release. The protests were called off only after the government agreed to allow a review of the verdict and initiate legal proceedings to bar Ms. Bibi from leaving the country. The government has been walking a tightrope as it tries to calm religious sentiments while also standing by Ms. Bibi after her acquittal. Officials have warned that Islamist leaders will be put under house arrest if they plan more street protests over Ms. Bibi’s fate. But hard-line religious leaders have traditionally paid little heed to such warnings, and in recent years they have organized large, crippling protests. Blasphemy is an incendiary subject in Pakistan, and the authorities have often been unable to control the violence and riots that have sometimes erupted over mere accusations. In 2011, Salmaan Taseer, an outspoken, secular governor of Punjab Province who had campaigned for Ms. Bibi’s release and for changes in the blasphemy laws, was shot and killed by his own police bodyguard, who was subsequently hailed by many as a hero. Last November, thousands of supporters of Mr. Rizvi’s religious party, Tehreek-e-Labbaik Pakistan, paralyzed Islamabad for days with protests over a proposed new oath for lawmakers, angry because the wording did not mention the Prophet Muhammad. The law minister was forced to resign over the omission, which the protesters considered blasphemy. The Supreme Court is expected to take up the review of Ms. Bibi’s acquittal next week. Mr. Malook, Ms. Bibi’s lawyer, said the military had assured him that his client was safe. “The Pakistani Army assured me that she remains safe, that nobody shall hurt her, and that she should be allowed to leave provided that she is safe,” he said.